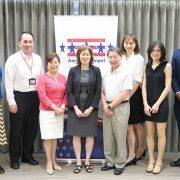 Revamping the Taiwan government’s rules-making procedures, preparing a stellar case for Trans-Pacific Partnership (TPP) candidacy, ensuring a stable and reliable supply of energy and water, and boosting Taiwan’s ability to attract and retain talent – these were the main recommendations presented by the American Chamber of Commerce in Taipei when launching the 2016 Taiwan White Paper on June 2. 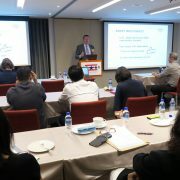 Nearly a hundred AmCham Taipei members and guests gathered at the Regent Taipei for the release of the annual benchmark advocacy document, which provides the Chamber’s recommendations to the Taiwan government on ways to strengthen the Taiwan business climate. 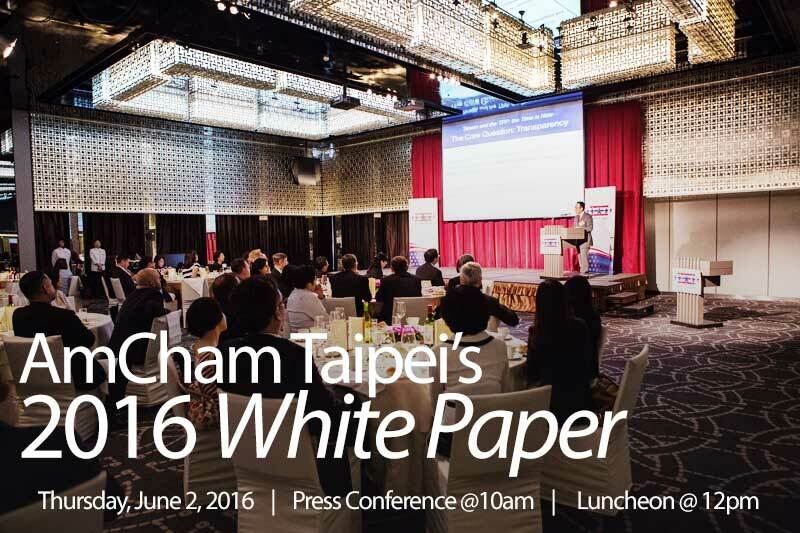 This year’s White Paper proposed a total of 80 suggestions from 20 AmCham committee plus three other industry groups. Accepting the White Paper on behalf of the Taiwan government was Deputy Minister Kung Ming-hsin of the National Development Council (NDC). 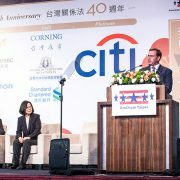 AmCham Chairman Dan Silver told the audience that “Taiwan can be a leader across many, many fields and can achieve things that other economies and countries in the region cannot.” But he added that “action is needed” for these positive developments to occur. Deputy Minister Kung accepted the White Paper on behalf of the Taiwan government. 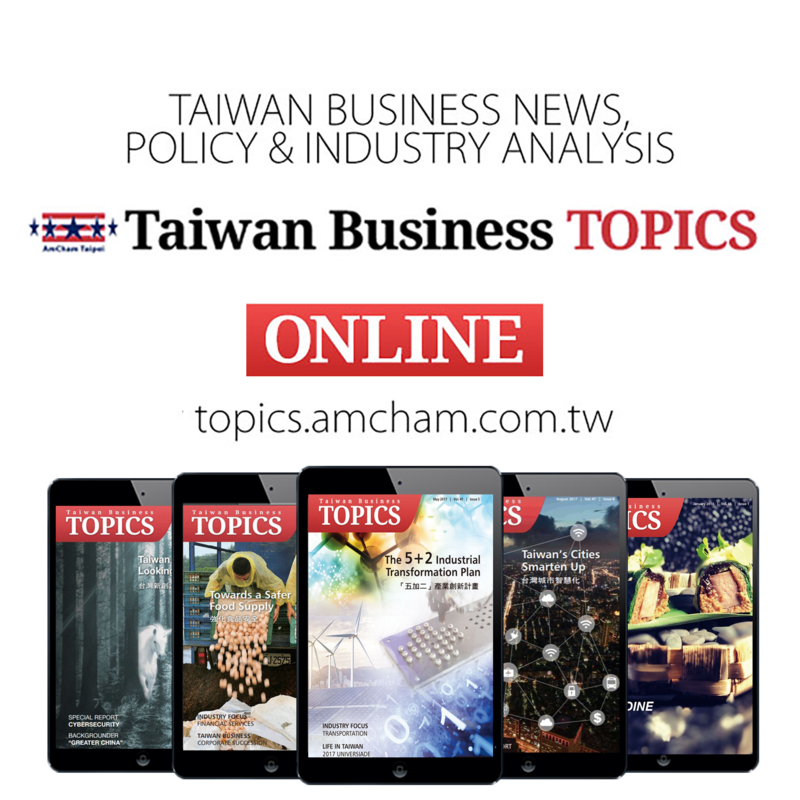 Silver emphasized the government’s need for a more transparent regulatory process, calling attention to Taiwan’s Administrative Procedure Act (APA), a statute that governs the country’s regulation-making procedures. 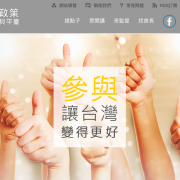 “We are calling on the administrative to look at the APA as an opportunity to step up engagement with the public at the Executive Yuan level,” he stated. Currently, Taiwan’s public-comment period is only seven days, which Silver argued does not allow ample time for feedback. In addition, government agencies normally do not respond to the public comments. Extending the notification and comment period to 60 days, providing a single website as the platform for feedback to proposed regulations by all government agencies, and requiring the agencies to post their response would create a more transparent process and result in more effective and practical regulations, Silver said. 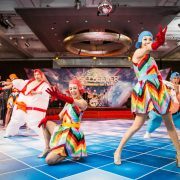 APA reform would also “provide solid evidence of Taiwan’s seriousness about promoting its second-round candidacy for the Trans-Pacific Partnership,” he added. The chairman also highlighted the need for the government to ensure a stable energy supply as it tries both to phase out nuclear power and sharply decrease greenhouse gas emissions. 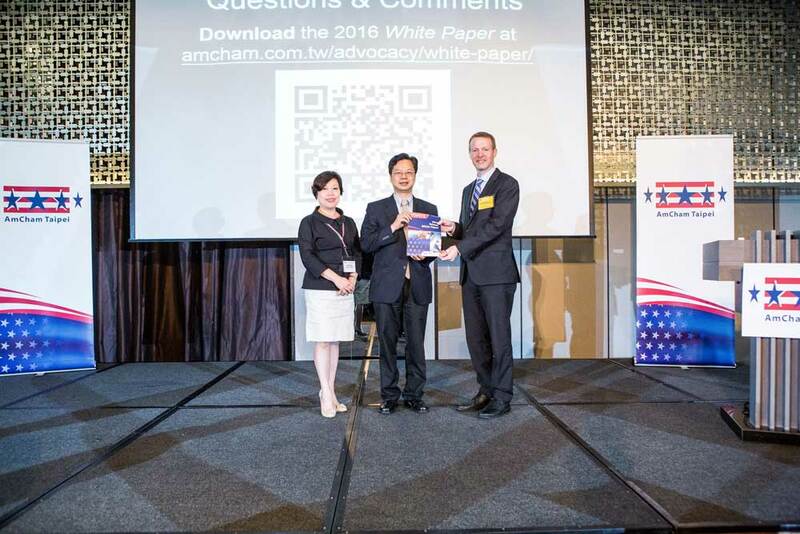 In the White Paper, AmCham urges the government to present a detailed, data-driven and realistic plan for meeting future energy demand. Silver also discussed the need for labor regulations that suit the desire by knowledge workers to enjoy flexible working conditions that spur innovation and creativity. Chairman Silver presented the advocacy document as a press conference earlier that day. Looking back at the issues raised in the 2015 edition of the White Paper, Silver noted that six issues had been completely resolved, while another eight have shown significant progress. 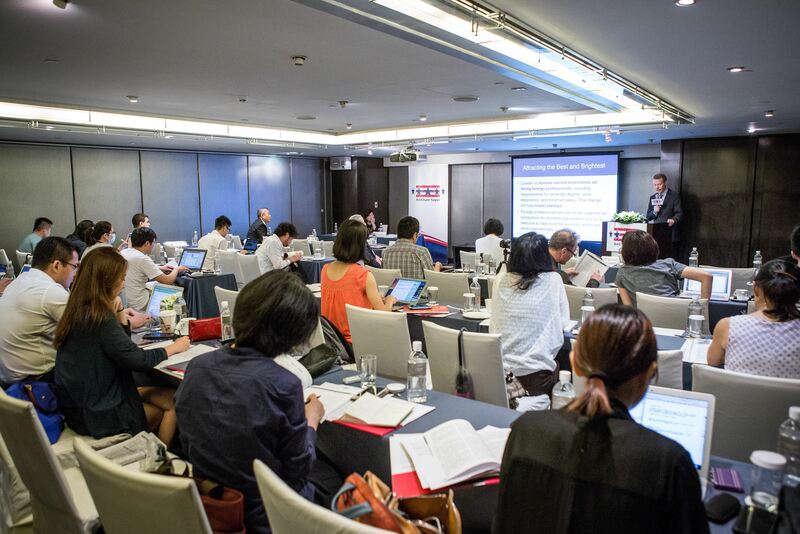 The resolved issues include two each from the Asset Management and Banking Committees, one from Sustainable Development, and one from Technology. In remarks after accepting the 2016 White Paper, Deputy Minister Kung emphasized the crucial importance for Taiwan’s economic future of gaining membership in the second round of TPP. 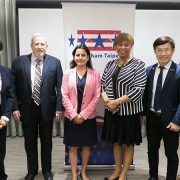 He also touched on the issues of attracting foreign talent and curbing domestic brain drain, suggesting possible stipends for Taiwanese students to matriculate abroad in exchange for commitments to return to work domestically after graduating. He also underscored the new government’s desire to improve public communication and coordination among government agencies. 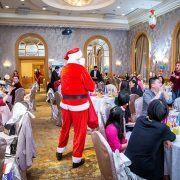 He noted that under the Tsai Ing-wen administration, the NDC will play an even more important role, in that Cabinet ministers will attend Council meetings and develop a consensus on economic policies before they are submitted to the Executive Yuan for final approval. 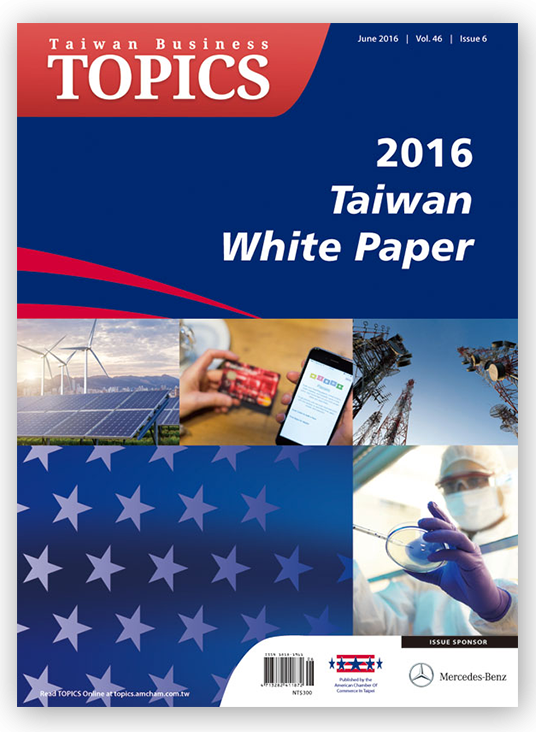 The 2016 Taiwan White Paper can be found online at www.amcham.com.tw/advocacy/white-paper. 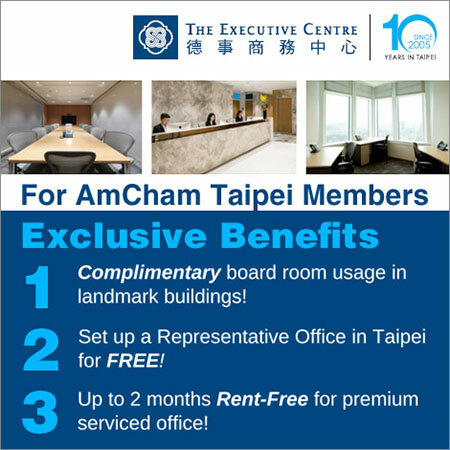 AmCham Meets with Control Yuan Happy Dragon Boat Festival!